Most of you may be curious to know about how to make a Trojan or Virus on your own. Here is an answer for your curiosity. In this post I’ll show you how to make a simple Trojan on your own using C programming language. Before I move to explain the features of this Trojan you need to know what exactly is a Trojan horse and how it works. As most of us think a Trojan or a Trojan horse is not a virus. 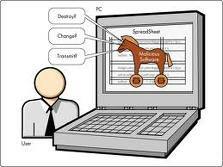 In simple words a Trojan horse is a program that appears to perform a desirable function but in fact performs undisclosed malicious functions that allow unauthorized access to the host machine or create a damage to the computer. The Trojan horse which I have made appears itself as an antivirus program that scans the computer and removes the threats. But in reality it does nothing but occupy the hard disk space on the root drive by just filling it up with a huge junk file. The rate at which it fills up the hard disk space it too high. As a result the the disk gets filled up to 100% with in minutes of running this Trojan. Once the disk space is full, the Trojan reports that the scan is complete. The victim will not be able to clean up the hard disk space using any cleanup program. This is because the Trojan intelligently creates a huge file in the Windows\System32 folder with the .dll extension. Since the junk file has the .dll extention it is often ignored by disk cleanup softwares. So for the victim, there is now way to recover the hard disk space unless reformatting his drive. 5. Once the drive is full, stop the process. You can download the Trojan source code HERE. Please note that I have not included the executabe for security reasons. You need to compile it to obtain the executable.